Priest Zoltan Lendavi has become quite a sensation on internet because of his unusual methods of praying, which according to him is just a new way to attract teenagers to church. His skateboarding videos has attracted huge number of audiences, with some versions having more than 170k views. He said that he got the idea from Saint John Bosco, an Italian priest and educator, who used games as a medium to connect with youngsters to educate them. 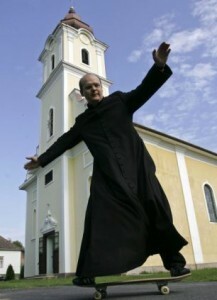 Hungarian skateboarding priest Zoltan Lendvai. The skateboarding method seem to have paid off well, as it started attracting visits from teenagers who had never been to a church. In Video, 45 year old father Lendavi is showcasing his skateboarding skills for some youngsters outside his church in Gaborjanhaza, a small village on Hungary’s border with Slovenia. Video of Reverend Zoltan Lendavi showing his moves to teenagers.